UPDATE: Jesse Watters' Twitter account is fake. But the questions we want him to answer are real. One of Watters' fans wrote this on his Twitter page in reference to Watters' cunning escape from this morning's attempted Gawker ambush: "escape and evade. Live to ambush another day." Watters responded: "I don't consider what I do 'ambushing', but thanks for the support." BILL O'REILLY, HOST: "Back of the Book" segment tonight, ambush journalism. As you may know, "The Factor" occasionally sends out producers to confront people who will not answer serious questions about controversial things they do, like judges giving child rapists probation, for example. Now, some object to displays like these. But we feel they're a vital tool in holding public servants accountable for their actions, and we do not go after people lightly. We always ask them on the program first, or to issue a clear statement explaining their actions. With us now "Factor" producer Jesse Watters, one of our field guides. 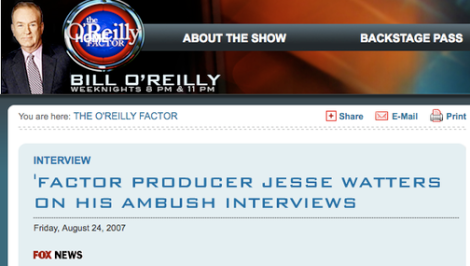 In 2007, Watters himself wrote a post on O'Reilly's blog about his unannounced interviews. It was called "Producer's Notebook: Ambushed." Watters ought to get his story straight. He also ought to be held accountable for what he does. For the record, our attempted ambush this morning was distinguished from Watters' way of doing business by the fact that we announced, on this blog, the very fact that we were trying to ambush him. It sort of undermines the whole point of an ambush, but we thought it was the gentlemanly thing to do. In that spirit, and to remind people why we are doing this, we've also decided to give Watters a head start on the questions we will ask him when we find him. Which we will. Is everybody compelled to defend their ideas and actions on television to Bill O'Reilly simply because he desires that they do so? 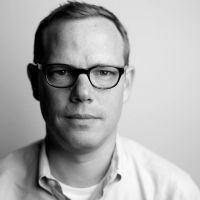 Why doesn't Mike Hoyt, the executive editor of the Columbia Journalism Review, whom you ambushed on his way to work after he said he was too busy to do the show, have a right to decline to appear on your program? Why did O'Reilly lie by saying that Hendrik Hertzberg "refused to come on 'The Factor'" last December, when in fact Hertzberg had received no invitation to appear on the show? And why did you participate in that lie by showing up at Hertzberg's home, without warning, to interview him on camera under the false pretense that he would not submit to a formal interview? Why didn't you just invite him on the show? Why did O'Reilly lie by saying that he contacted ThinkProgress, the nonprofit that employs blogger Amanda Terkel, before he sent you to ambush her? And why did you participate in that lie by following Terkel from her home in the Washington, D.C., area for two hours and then confronting her outside a hotel in Virginia while she was on a weekend getaway? Why didn't you just invite her on the show? How can you refuse to defend your tactics to us, or to the New York Times, when you have repeatedly harassed other people in your efforts to force them to defend themselves? What makes you less accountable for your actions than Hertzberg, or Terkel, or Hoyt? Why are you and O'Reilly permitted to have your questions answered, whenever you like, by anyone you seek to question, while no one else may question you? Aren't you a coward? Why didn't you identify yourself as a Fox News employee who was there to gather audio for a television program when you entered the GE shareholders' meeting this week in Florida under the pretense that you own GE stock? Why didn't you alert the participants that you were recording the conversation? You wrote that when you ambushed Mike Nifong, the prosecuter in the Duke lacrosse case, "it didn't register until then that I had gotten him on camera in his bathrobe and slippers. As serious as the legal circumstances were, I couldn't help but smile." Why did you smile? Do you think it's funny to capture people on camera in their bathrobe and slippers by sneaking up on them? Is that why you do it? You wrote that when you ambushed Meyera Oberndorf, the mayor of Virginia Beach, Va., you were "trying to elicit an emotional response from her." Why? Weren't you trying to get answers to your questions? Why were you trying to rile her emotions? After her husband confronted you and tried to wrestle your microphone away from you, you told your crew that "this will be great TV." Is that why you ambush people? Because physical confrontations and emotional women make "great TV"? David Tabicoff, your fellow producer at the O'Reilly Factor, told the New York Times, "We're trying to get answers from people. Sometimes the only way to get them is via these methods." Has anybody, ever, actually answered a question during one of your ambushes? Is the point to get answers, or is to get embarassing footage of you chasing them, hounding them, and peppering them with questions? Because if it's the latter, that would help us refine our tactics when it comes to interviewing you. 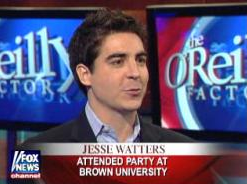 Know something we should know about Jesse Watters? Email me.